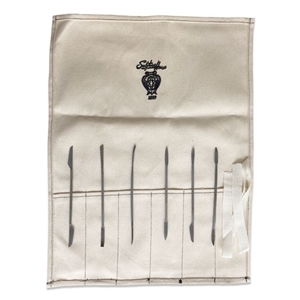 The miniature riffler-rasps in this set of 7 authentic Italian-crafted tools, made from C100 Italian carbon steel, have been exclusively hand-forged by Master Craftsmen where each tooth has been meticulously cut and set by hand. The delicately punched teeth on each rasp's 2 uniquely-shaped ends provide the stone and wood carver a tool for fine detail work on wood, stone, and plaster. Shapes include: spears, half-rounds and paddle-shaped ovals and skews. A must have for the finishing process. Teeth have been expertly punched on all sides of the rasp and along its edges providing complete tool usability. Approximate length of each rasp - 6" (15 cm); each rasp end approximately 1" in length. All rasps are enclosed in a canvas roll for ease of carrying as well as protecting them when not in use.